Read our summary of National Institute for Health and Care Excellence guidance to help nurses recognise and respond to abuse and neglect of children. One in five children in the UK has experienced severe maltreatment, according to the National Society for the Prevention of Cruelty to Children. Cruelty to children and young people is a criminal offence, and child abuse and neglect can have serious adverse health and social consequences for victims into adulthood. It can have an effect on growth and physical development and increase the likelihood of antisocial behaviour, suicidal thoughts and suicide attempts. 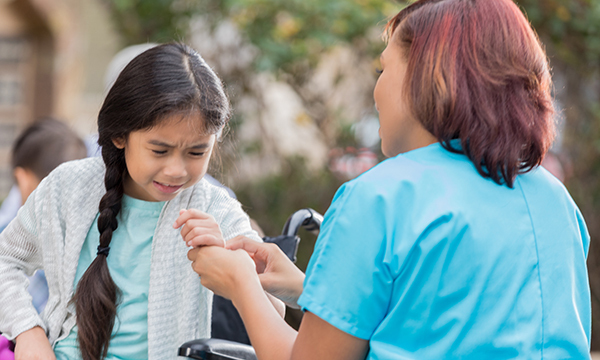 Guidance to help nurses recognise and respond to abuse and neglect in children has been published by the National Institute for Health and Care Excellence (NICE). It covers physical, sexual and emotional abuse and neglect, and sets out early intervention and therapeutic services that should be provided to families. Staff working with victims of abuse and neglect should be offered supervision, reflective practice and emotional support, it says. There is a wide range of physical, emotional and interpersonal behaviours that can prompt consideration of abuse or neglect if they cannot be explained by other events or conditions. There could be a marked change in behaviour, extreme distress, becoming withdrawn and withdrawal of communication. Being fearful, having low self-esteem and being aggressive can be indicators. Affection seeking and over-friendliness to strangers can be signs. Physical signs include cuts, bruises, burns, bites, spinal injuries, eye trauma and ano-genital injuries or symptoms. Parents with substance misuse problems, a history of domestic abuse, emotional volatility or problems managing anger, and mental health problems which have a significant impact on the tasks of parenting can all increase risk. Socioeconomic factors such as poverty and poor housing can also increase risk. Children with disabilities are more vulnerable to abuse. Speak in private to children and young people when there are concerns they may have been abused or neglected. Be sensitive and empathetic, listen actively, and use open questions and plain language. Use your judgement, act on concerns and follow up to make sure action has been taken. If a child or young person tells you they have been abused or neglected, make a referral to children's social care using local procedures. Contact the police if there is an immediate risk of harm. ‘While child protection is everyone’s responsibility, nurses – and children's nurses in particular – are centrally placed to act on early concerns of child abuse and neglect. All staff involved with child protection should know that child abuse and neglect can happen anywhere, in any place or setting, and to any child regardless of socioeconomic background. ‘Lessons should be learnt, but are often not, from reports and serious case reviews. Children's welfare is paramount and all of us have a duty to report concerns in a timely manner. ‘Using the appropriate evidenced pathways and gateways is key to effective investigation and management of concerns.